I love birds. They remind me of Carson Brooks. In a moment of hopelessness, fighting hard the instability of the chronic bipolar disorder he lived with, he once told me he "felt like a bird with broken wings." To me, the bird could be waiting for someone to care for this precious creation from God. It could be waiting for someone to welcome it in out of the cold. Perhaps the door could lead to a warm house, a welcoming church. The closed door reminds me of the struggle those with mental illness face daily, in a world that wants to pretend the pain of such invisible illnesses don't exist. 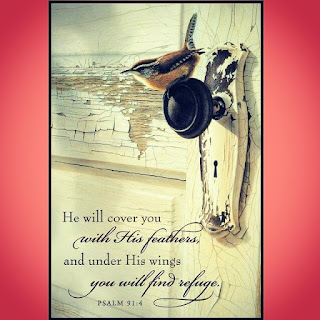 I praise the Lord that He will always be our refuge! HE knew each of us before we were conceived. He knew we would deal with some form of brokenness. I know from Scripture the Lord intended for us to carry one another's burdens. Our families, our churches, our communities would be so different ... if we stepped outside of ourselves and became aware and educated about mental illness, about how each one of us can help.